Coinciding with the retrospective at New York’s Museum of Modern Art, Christie’s is proud to offer an acclaimed masterpiece by Cindy Sherman consigned by the Akron Art Museum, Ohio. All proceeds from the sale will be directed to the museum’s acquisition fund to allow for future strategic purchases that will augment the core of the Akron Art Museum’s strong Contemporary collection. Cindy Sherman’s Untitled #96 is recognized as an icon within her career to date. Another example of this image was sold at Christie’s in May 2011 for $3,890,500, which represents not only a world auction record for Sherman, but also a world record price for any photograph at the time. * The work from the Akron Art Museum is a vintage print in excellent condition and will have a pre-sale estimate of $2,800,000 – $3,800,000. Akron Art Museum has for thirty years strategically used funds to acquire great new works for its collection, ranging from American masters Philip Guston, Frank Stella and Chuck Close in the early 1980s to more recent purchases of works by Kiki Smith and Yinka Shonibare. Dr. Kahan notes that the museum will retain in its collection another 1981 masterpiece by Cindy Sherman from the Centerfolds series, Untitled #93 (Black Sheets). Akron Art Museum has a longstanding commitment to Sherman’s work, having organized her first major exhibition in 1984, which traveled to the Walker Art Center and the Whitney Museum of American Art. “Untitled #96 represents the apotheosis of what Rosalind Krauss termed Sherman’s ability to distill a ‘copy without an original’ and thus signify pictorial archetypes that define our culture,” adds Andrew Massad, International Contemporary Specialist. Untitled #96 is an outstanding example from her highly acclaimed Centerfolds series, which Sherman made as a project for Artforum magazine in 1981. Untitled #96 is recognized as the most important work from the series. It showcases all the themes and ideas of Sherman’s best work, yet is also the most paradoxical of the series. The artist composed the image clearly, but left the narrative behind it deliberately ambiguous. Sherman adopted the persona of a teenage girl in this large, almost life-size photograph. Lying supine on the floor, she clutches a page torn from the newspaper classifieds—perhaps a personals ad. The work’s scale and the boldness of Sherman’s tight compositional framing exude surprise and confrontation, yet the figure at the work’s center is also endearing and curiously vulnerable. Sherman places these conflicts at the very heart of her work, questioning not only the medium of photography, but also our wider assumptions about gender and truth in the modern world. 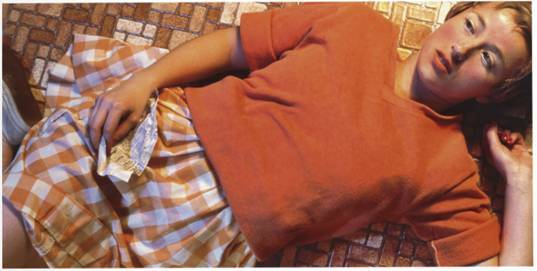 Untitled #96 is among the best examples of Cindy Sherman’s entire oeuvre. Several of the world’s major museum and private art collections include examples from this small edition. This image has become the icon of the major retrospective currently at the Museum of Modern Art and is reproduced in all the media related to this show. May 2011, Christie’s set a world record for any photograph ever sold at auction with Sherman’s Untitled, an example from her 1981 Centerfold series, comparable to Untitled #96 which achieved $3,890,500 in the Post- War and Contemporary Art Evening Sale. Christie’s has broken this world record only 6 months later with Andreas Gursky’s Rhein II for $4,338,500. Christie’s, the world’s leading art business, had global auction and private sales in 2011 that totaled £3.6 billion/$5.7 billion. Christie’s is a name and place that speaks of extraordinary art, unparalleled service and expertise, as well as international glamour. Founded in 1766 by James Christie, Christie’s conducted the greatest auctions of the 18th, 19th and 20th centuries, and today remains a popular showcase for the unique and the beautiful. Christie’s offers over 450 sales annually in over 80 categories, including all areas of fine and decorative arts, jewelry, photographs, collectibles, wine, and more. Prices range from $200 to over $100 million. Christie’s has 53 offices in 32 countries and 10 salerooms around the world including in London, New York, Paris, Geneva, Milan, Amsterdam, Dubai, Zürich, and Hong Kong. More recently, Christie’s has led the market with expanded initiatives in emerging and new markets such as Russia, China, India and the United Arab Emirates, with successful sales and exhibitions in Beijing, Mumbai and Dubai. The Akron Art Museum, dedicated to enriching lives through modern art, showcases regional, national and international art created since 1850. The museum’s collection houses over 5,000 objects. Particular areas of strength include contemporary painting and sculpture and 20th century photography. Nearly a dozen exhibitions each year present celebrated artists in various media including painting, sculpture, photography, video, design and glass. The museum’s internationally acclaimed expansion, designed by Austrian architectural firm COOP HIMMEL(B)LAU, opened to the public in July 2007. The new John S. and James L. Knight building features a soaring glass and steel structure described by critics as a work of art itself. In addition to its ever-changing collection and exhibitions, the Museum offers many opportunities to discover new perspectives through dynamic programs that include films and videos, lectures, workshops, tours and concerts. This entry was posted in akron, Art News, arts, exhibits, galleries, museums, ohio and tagged akron, akron art museum, art, art news, arts, christies, exhibit, exhibition, gallery, illustration, museum, New York, NY, ohio, walker art center, whitney museum of american art, yinka shonibare. Bookmark the permalink.